With ProSlice: Slide from Pixel Film Studios user can create a slice effect to call their very own. ProSlice: Slide offer complete customization over divisions, rotation, placement, angle, and up to 5 panels. Users have total control over speed, ease, and more all with a click of a mouse. 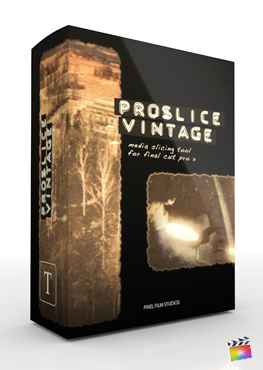 With ProSlice: Slide users can now create a stylistic slice effect with complete customization all within Final Cut Pro X. Users have total control over overall position, overall rotation, divider position, divider width, divider color, panel vertical and horizontal rate, panel ease, and more all with a click of a mouse. ProSlice: Slide on-screen controls offers users room for endless possibilities. With each on-screen control user can push and pull each division and create a new look each time. With total control over rotation and position users have the ability to design their own slice with a click of a mouse. ProSlice: Slide offers total control over rotation, position, and division with up to five panels users can create something new each and every time. With ProSlice: Slide the possibilities are truly endless all with a click of a mouse. ProSlice: Slide was professionally designed to work seamlessly inside of Final Cut Pro X. As a effect overlay, each ProSlice: Slide preset can be dragged and dropped onto media and previewed in real time. With the published parameters found in the FCPX inspector, users have the ability to make further adjustments with just a few clicks of a mouse. I installed ProSlice: Slide and see a red screen similar to this. Where do I find ProSlice: Slide? Once the installation is complete, you can find ProSlice: Slide in the FCPX Effects library. Where is the tutorial for ProSlice: Slide?